We're rapidly hurtling towards December which means its time to tell you of our plans for the festive period. Christmas and New Year's Days are the only time we can hold parkrun outside of a Saturday and we're pleased to say that this year we will have an event on both days - starting at 9am as usual. Obviously these events can only go ahead with the support of our volunteers so do get in touch if you'd like to be part of the festive fun! Saturday's run showed how wonderful the parkrun community is, especially in a crisis. A huge thank you to all of our wonderful runners and marshals who were fantastic support when one of our regular runners collapsed on the course. He was given excellent care and we are pleased to report that he is doing well. He was being kept in hospital overnight for observation. If we get any updates we will of course pass them on. This does of course highlight the brilliant idea of having your ICE details on your barcode. Should anything happen, those nearest and dearest to you can be informed straightaway. You can access your profile from the links in any email from parkrun and add those details - then remember to reprint your barcodes! The more durable barcodes that you buy can have these details added too. Please please consider updating your details if you haven't already. It was abit damp (summer is well and truly here!) on Saturday, but it didn't stop 194 of you crossing the finish line. We welcomed 13 first-timers (including one extra special one. More on him later!) and a whole host of tourists from Workington, St Albans, Penrith, Finsbury, Rutland Water, South Manchester, Yeovil Montacute, Barrow and Dartford parkruns. 32 of you ran a new PB. Congratulations all of you, including first finisher Ross Landon, Mark Moody, Francesca Bee and juniors Jenna Carruthers, Aidan Carruthers and Evie Little. You may notice regular timekeeper Neil Errington missing from this weeks list. That's because it was his birthday, and he celebrated by doing his first (and possibly only) parkrun! A huge well done Neil from all of us! Unfortunately, noone got a photo! Use the links at the bottom to get in touch, or you can visit the volunteer page on our website for more information. 3 milestones to report from Saturday. Andy Caven and junior Jamie McGough joined the 50 Club, while Matt Begg did his 100th parkrun. Well done guys. I don't think Matt will mind me saying that when he turned up to do his first run, there weren't many of us who thought he'd be back! Over those 100 runs he's gone from strength to strength and it led him to the startline of the London marathon this year. The power of parkrun! Paul M GRAVES (DH Runners) 2278 pts. Robert HASTINGS (Unattached) 2244 pts. Chris KNOX (Carlisle Sheepmount RC) 1929 pts. Annika STUMPF (DH Runners) 2273 pts. Louise DUFFY (DH Runners) 2228 pts. Bethany DUFFY (DH Runners) 2141 pts. Colin DONNELLY (VM55-59) was graded 84.70% for the time 18:18 (6th overall). Paul M GRAVES (VM35-39) was graded 78.58% for the time 17:07 (third overall). James BUIS (VM35-39) was graded 78.32% for the time 17:18 (4th overall). Apologies for the absence of a run report over the past few weeks. I've been away touristing at Lincoln parkrun (a run that started with snow on the ground and ended in bright sunshine!) and supporting our amazing runners at the London Marathon. parkruns. Phew! Thanks for coming along, I hope you enjoyed our course. Congratulations to Melissa Bills on joining the 50 Club (thanks for the cake! ), and to Marcus Dodd and Rhys Bills on reaching the junior 10 milestone. Robert HASTINGS (Unattached) 1398 pts. Paul M GRAVES (DH Runners) 1288 pts. Chris KNOX (Carlisle Sheepmount RC) 1129 pts. Annika STUMPF (DH Runners) 1381 pts. Bethany DUFFY (DH Runners) 1317 pts. Louise DUFFY (DH Runners) 1308 pts. Gavin BANNISTER (VM55-59) was graded 77.61% for the time 19:48 (6th overall). Callam PLUNKETT (SM20-24) was graded 74.62% for the time 17:28 (first overall). Philippa WAKEFIELD (VW35-39) was graded 73.58% for the time 20:34 (7th overall). When it's busy, the path leading into the park can get congested as the runners set off. Please take care when heading out the gate and keep an eye out for the Run England posts! Morning everyone. Unfortunately we are having to cancel parkrun on both June 20th (Manor Fest is taking place in the park) and July 11th (there is a 10am wedding). If you need your parkrun fix, Workington, Penrith, Keswick, Fell Foot and Barrow are the other Cumbrian parkruns that would welcome you with open arms! 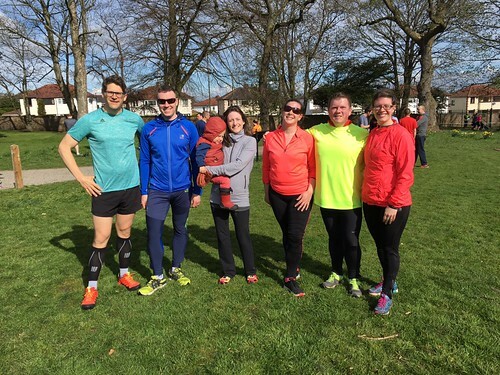 It felt like we had four seasons in one parkrunday yesterday! 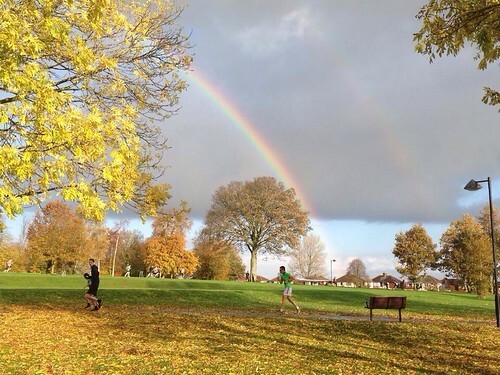 Dull and grey, rain, sun, that glorious rainbow (thanks to Kathryn Osborne for the photo) and mud. Lots of mud by the time you got onto the third lap! Of the 145 runners at the start line, we had 17 first-timers: 9 of whom are brand new parkrunners (we hope you had a great time and look forward to seeing you again) and a good number of tourists. Amongst them was Nigel Coombes, who has run 59 times at 16 different parkruns and Graeme Spencer who not only ran, but also helped Andrew and Kev with the morning set-up. Thank you Graeme - much appreciated. Fun Fact (maybe!) - Since we started in January 2013, 2,016 different runners have made their way around Chances Park. It's been heading closer to the 2,000 runners mark each week, and on Saturday we tipped over. Brilliant! Congratulations to Amelie Marshall who joined the 10 Club. I know plenty of people are still waiting for club t-shirts. Be patient, they will arrive. I'm sure some of you have received the same email as me explaining the issue - I knew there were alot of people joining the various clubs every week, but I hadn't realised that parkrun HQ were sending out approx 1500 t-shirts each month. It's no wonder the system needed an overhaul! An unknown runner was first. William SMITH (JM15-17) (Unattached) was third in 19:56. 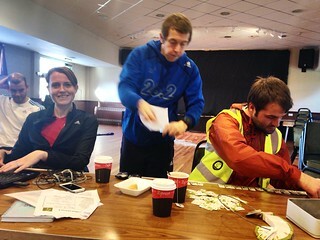 DH Runners are holding another Magic Mile event at the Sheepmount. 2pm November 8th. Come down and see how fast you can run a mile on the track. 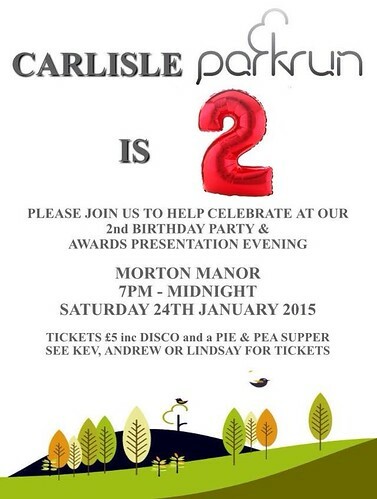 It was great fun when it was held in the summer, so if you couldn't make it then hopefully you will on Saturday. Same time next week then?